MerchantCircle | Blog: Shake It Like a Polaroid Picture! Instead of Beyonce's and Lucy Liu's we're talking about Facebook and Craigslist among our esteemed colleagues. On top of being named Top 100 Private Companies next to such industry stalwarts, MerchantCircle also garnered the award of Newcomer of the Year! Past winners include Linden Lab (of Second Life fame) and Photobucket - both of which are pretty cool services. 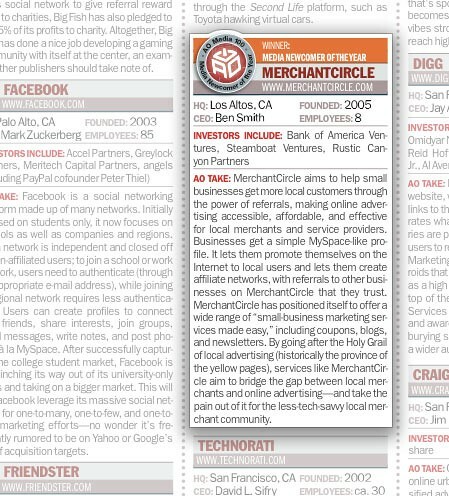 We're excited to be recognized, but the award stands more for our 75,000 business owners who have claimed their business listing and taken it upon themselves to manage their online business reputation. We'll continue to innovate and if you'd like to throw Beyonce and Lucy Liu our way as well, we might even dust off the robot. Congrats! I've been watching MerchantCircle for awhile. You all have made major improvements! Keep up the good work and I can't wait to see what the future holds.